The commercials sucked me in. For two days, I’ve watched nothing but basketball and a big sponsor of the NCAA Tournament on CBS is Buffalo Wild Wings. J has been saying for a while now that we needed to go to B-Dubs sometime soon and I didn’t disagree. We had planned to go for lunch, but J got home from work late and has been battling a cold, so she wanted to relax a little bit. By the time she got hungry, it was close to dinner. Going to dinner at a chain restaurant on a Friday night is never a fun experience and going to a Buffalo Wild Wings during March Madness just adds to the craziness. 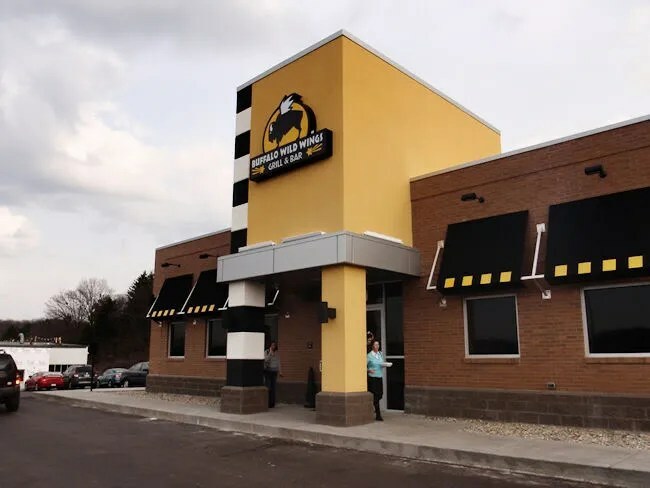 Earlier this week, Buffalo Wild Wings opened their new location in the 3200 block of Stadium Drive just 300 feet or so from the old location. The new building has an updated look and feel from the other building which had been in use for fifteen years. Like I figured, the restaurant was packed. It just so happened that the hostesses were cleaning off a table right next to the door as we walked in. We were the only people waiting, so the hostess finished and showed us to the seats. I’ve eaten in B-Dubs many times, but only once or twice in the actual restaurant. When I was a regular of the “new” store in Peoria, we always went to the bar, but fighting for a table in that area would have been a little harder. The new space is like most B-Dub locations. There are TV’s everywhere in a pretty wide open dining room. It’s so wide open that it is incredibly loud. Almost deafening. Noise is definitely a factor. The menus were already on the table when we sat down, so we grabbed one and started looking. While I’m a big fan of the wings, they’re really not a very good value. They may be tasty, but they’re pretty small and not worth the price on any night other than Tuesday when they’re half price. We sat for quite a long time waiting to be served. The waitresses were running around, but nobody seemed to notice. There was even a manager almost literally sitting on top of me and he never once acknowledged us or grabbed a waitress to see what was going on. Eventually, a waitress stopped by and asked if we had been taken care of us. We said no and she said she didn’t know where the waitress who was supposed to have our table was so she just took it. That worked out really well because it seemed like she was the only waitress that was keeping up with her tables. We both started with Cokes and by the time the waitress came back with them, we were ready to order. I wanted wings, but I didn’t want to pay the premium price for them. Instead, there was an insert in the menu for slammers which are basically sliders. I went with the Steak Slammers which are three mini sandwiches with sliced beef. The menu looked like they had sauce, but I was never asked if I wanted any. Each sandwich came with just enough meat to cover the bun. The steak had a good grill seasoning taste to it and it was nice and tender. Steak sandwiches can be chewy, but these weren’t. 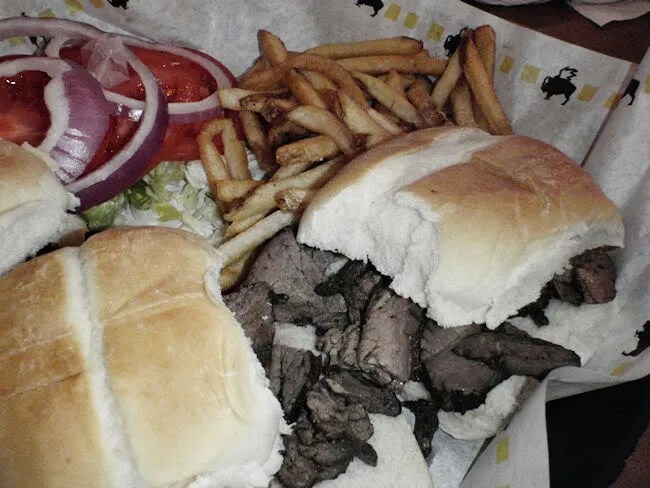 The sandwiches came with fries which is something I have never had at Buffalo Wild Wings before. The fries are shoestring skin on fries. They’re good, but there wasn’t a lot there which is the same sentiment I had for the Slammers. They were good, but I left really hungry. J was looking at the Chicken Tender Slammers, but went back to her old standby, the Chicken Tender Wrap. 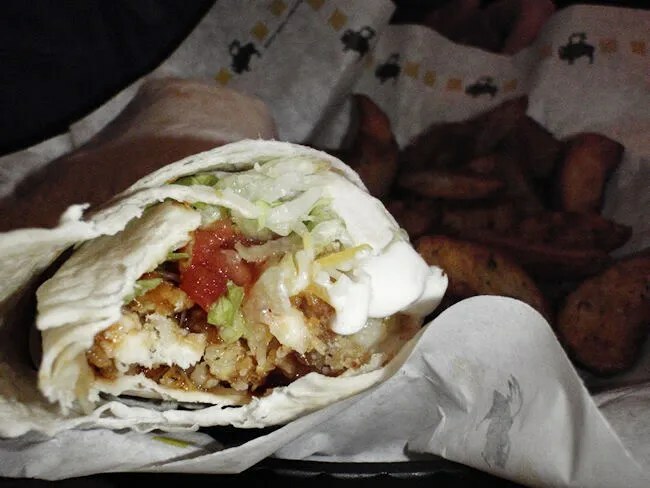 She ordered the wrap with no tomatoes, Honey Mustard on the chicken and ranch on the side. The wrap showed up with tomatoes, but she said it didn’t really bother her because the tomato was not ice cold. She was happy with the wrap even without much of an appetite. Her sandwich was supposed to be served with chips, but it came with potato wedges. The wedges have a sour creme and chive flavoring and were a good accompaniment to the wrap. For as busy as they were, our waitress really did a good job of staying on top of things. Not long after J finished up, our bill was set down on the table and less than ten minutes later, we were walking out the door. At twenty bucks, I was happy with the price, but really could have used some more food. 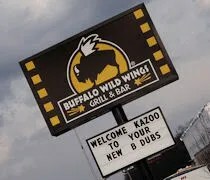 I’ve always been a big fan of Buffalo Wild Wings, but I try to go on Tuesday nights when I can afford a bunch of wings. Still, we had a good dinner and after some early hiccups and resigned to the fact there is no way to have a conversation, B-Dubs does come through as a great sports bar.